Edited by: Julia Besten, Irene Girsang. With a preface by: Julia Besten, Irene Girsang. With contributions by: Irene Girsang, Hannelore Groth, Barbara Jordans, Gesine von Kloeden, Christel Westerhausen †, Ursula Wörmann. Series edited by: Archiv und Museumsstiftung der VEM, Wuppertal. Women in the mission – they are present since the beginning, they worked, prayed and served the mission. They were and are until today wives and mothers, sisters and missionaries. The working team Frauen in der Mission (Women in the Mission), initiated in 1933, set itself the goal of taking a closer look at women’s labour as a part of missionary work, aiming at a holistic de­scription. Since then, the work of many women in the Rhenish Mission and the Bethel Mission, the forerunning organisation of the United Evangelical Mission (UEM) has be­come a topic to historical research. After the publication of Sisters from Two Worlds (vol. 2 of the present series) in 2008 about women in the missionary work of Namibia, the working team now focused on the women of Sumatra, Indonesia, where the Rhenish Mission has started their work at the Toba Lake in 1861. On the occasion of the anniversary of the Mission’s arrival 150 years ago, the Archives and Museum Foundation of the UEM together with the UEM initiated a closer examination of their past on Sumatra. 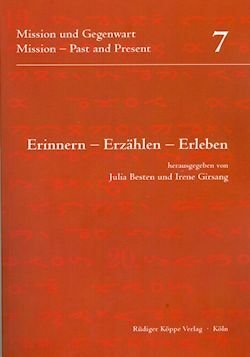 After the publication on hand was presented on Sumatra under the Indonesian title Menabur Kasih Berbuah – Perempuan Berjumpa Misi di Tanah Batak in June 2011, Erinnern – Erzählen – Erleben represents its German translation. This book does not claim scientific significance, rather the examples of the women in the Mission the variety of their work then and now as well as their dedication are vividly illustrated. Many women in the churches and church congregations help shaping church life, speak up for rights, faith and peace, for health and education. The stories try to show how valuable their work is, and take a look at the past which is profitable for a better understanding of the present and an awareness of the roots.